Carolyne Roehm has proved herself in the atelier with a fashion collection, at home with beautiful interiors, in the garden, behind the lens and most recently with a paintbrush. It makes you wonder, really, what can’t she do. But Carolyne is an avid and dedicated student and once she decides on a new arena of creative output, chances are, she will master it. With nature as her muse, she is infinitely inspired and constantly looking for new ways to capture its beauty. 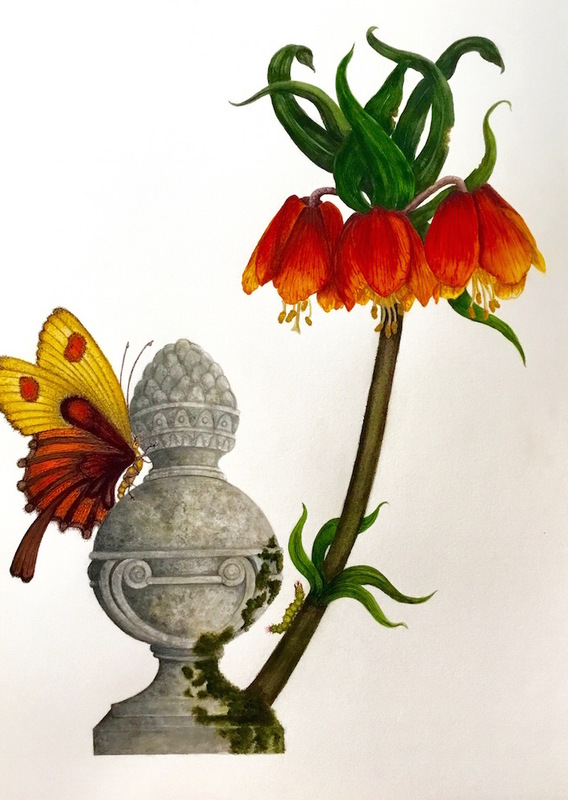 In her latest book, At Home in the Garden, you got a glimpse of her latest endeavor, but now limited edition prints of Carolyne Roehm watercolors will make their debut at Mecox New York this Thursday. 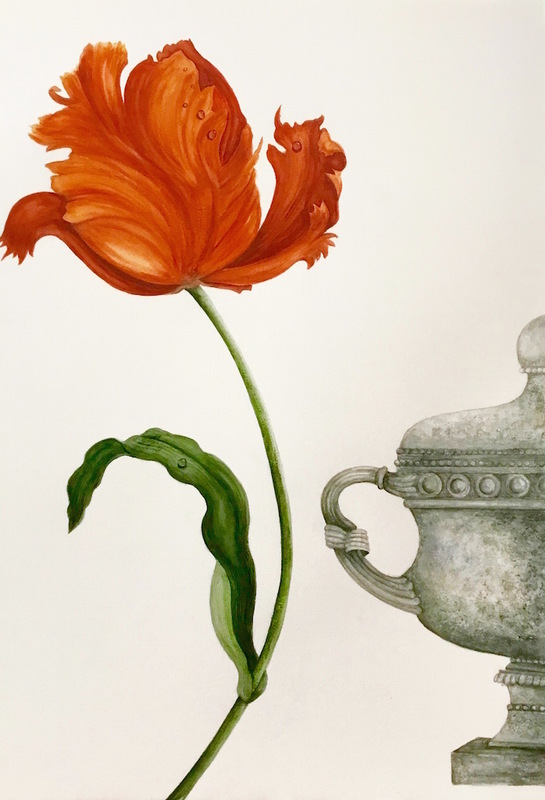 While these new works resemble classic botanicals, Carolyne explains that hers are not intended to be scientifically accurate but rather modern stylized versions. 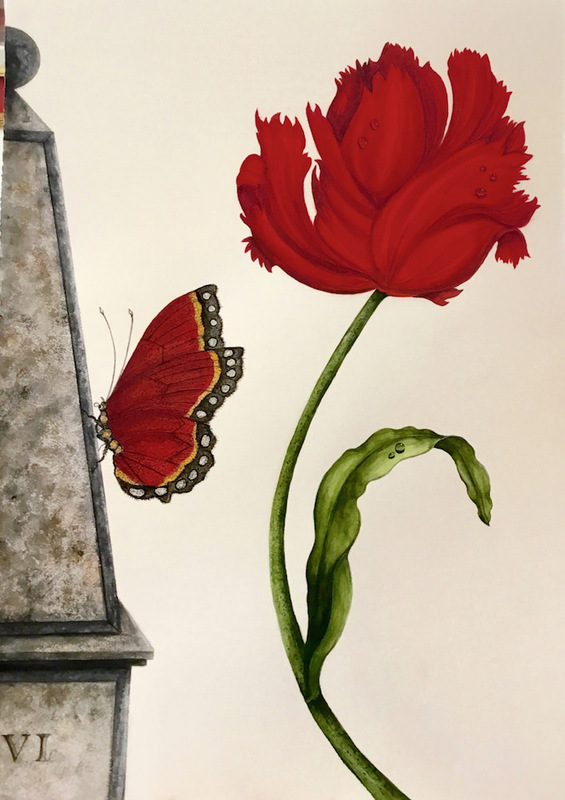 Past masters of the genre such as favorites Maria Sibylla Merian and Alexander Marshal may serve as inspiration but Carolyne considers her watercolors more bold fantasies than faithful reproductions of nature. When Carolyne first shared her watercolors in the book, many people, including myself, asked if she might consider selling them or at least making prints of the originals. So finally that is exactly what she has done. The exhibit at Mecox will include prints in three sizes, the largest at approximately 42″ tall, all professionally printed on the highest quality paper to resemble the original watercolors. Some of the originals will also be shown framed in several styles as suggestions. For those looking for perfect hostess gifts, there will also be printed notecards with envelopes. Carolyne’s process begins by photographing her flowers and then drawing the images to scale, which are much larger than you might realize. Her collection of butterfly specimens serves as models as well as a burgeoning library of bug reference books. I particularly like the inclusion of architectural garden elements, which are also featured in her latest watercolors of birds. 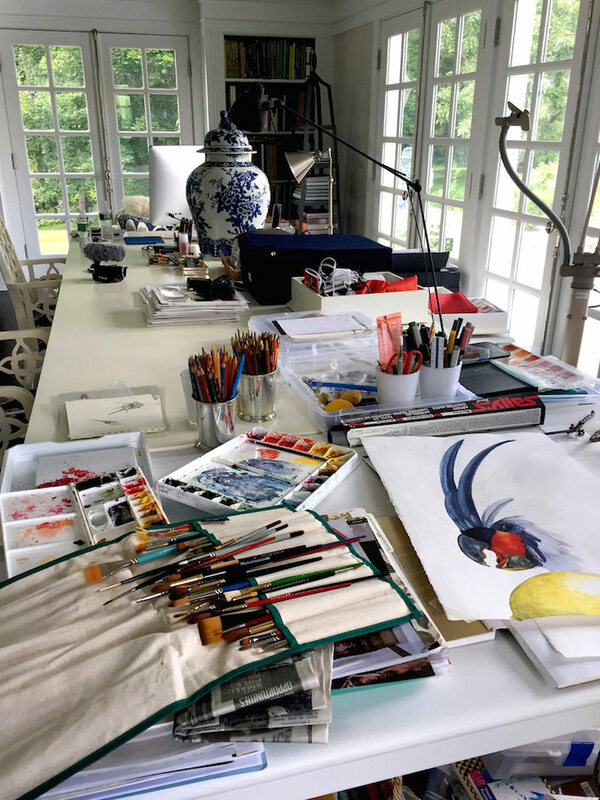 Her well lit Connecticut studio allows her room for a full arsenal of tools and works in progress, which take anywhere from 5 days for the smallest to several weeks for the large watercolors. 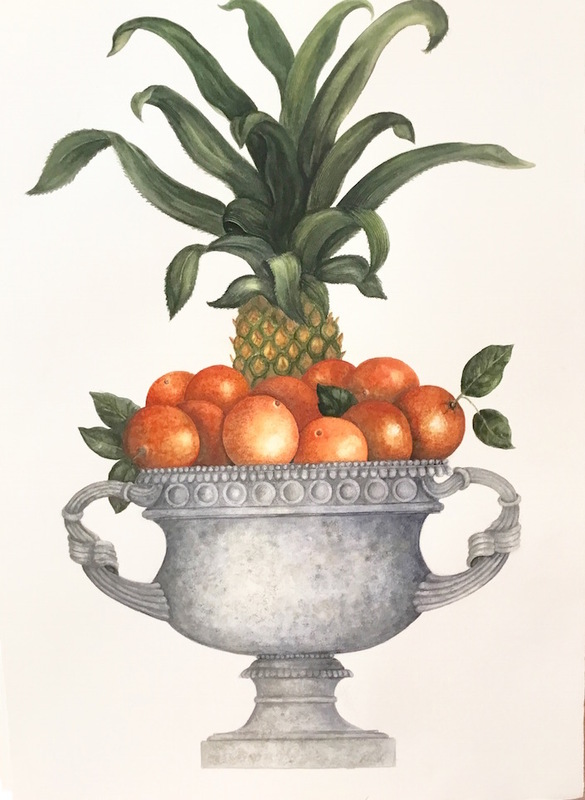 Not only will you be able to preview and purchase Carolyne Roehm watercolors at Mecox, but there will also be books on hand for Carolyne to sign. To see Carolyne explain her work in person and for a tour of her magnificent gardens, please tag along again with me and Susanna (or for the first time if you missed it last year) for a video visit with Carolyne at Weatherstone, her beautiful Connecticut home. This entry posted in art, interior design. 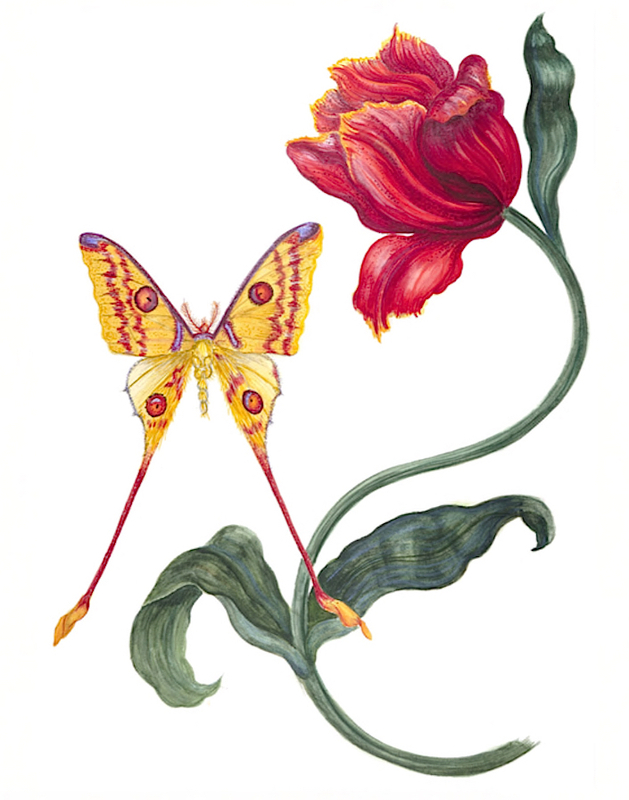 Entry Tags: art, botanicals, Carolyne Roehm, flower watercolors, Mecox New York Bookmark the permalink. “The concept came after the doing”. So glad I watched again for this line…x. What a remarkable woman. Everything she does is absolute perfection. Ms. Roehm continues to be an inspiration to all those who seek to create beauty in their lives. Thank you for this, CR is indeed SO talented … I love the urns and obelisks, as much as the flowers and insects…. I went back to watch not only this video, but the one in which Susannah went shopping with CR at Associated Flowers…so fun! I must tell you, though, whenever I hear the opening notes and then all of the video music theme, they are so upbeat… they make my day. The video then, is pure gravy. Thanks for all you and SS do! She is a renaissance woman. Thank you for this beautiful post, Stacey! I’ll say it again: a force of nature. I have been an admirer of hers for years.Exquisite!Love all your videos! What a treat! I got lost in Carolyne’s garden for a few moments. A magical escape! Such beauty and talent. Thanks so much for sharing. I share all the previous comments. Have admired CR for years. Wonderful! I love watching it! Amazing woman, so inspired! Beautiful painting and such an amazing lady, thank you so much for sharing. 83 queries in 0.668 seconds.